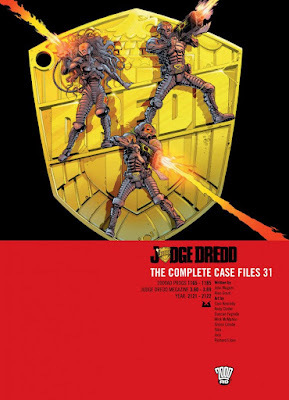 Judge Dredd: The Complete Case Files #31 is the next installment in the Dredd series, compiling the first portion of stories that were released in the beginning of the year 2000. Judge Dredd, for those that don’t know, is the fiercest of all of the Judges, serving as judge, jury, and executioner, one of many trying to prevent total anarchy in Mega-City One, during the years 2121-2122 AD. The 24 stories contained in this volume were originally published in the comic books 2000AD Progs 1165-1185 and Judge Dredd Megazines 3.60-3.69. It features writing from John Wagner and Alan Grant, and art from Siku, Colin Wilson, Andy Clarke, Paul Marshall, Peter Doherty, Steve Parkhouse, Simon Davis, Mick McMahon, Cam Kennedy, Jason Brashill, Dean Ormston, Wayne Reynolds, Ben Wilsher, Henry Flint, Duncan Fegredo, Jock, Simon Coleby, Anthony Williams, Ben Oliver, and Richard Elson. It’s a truly fabulous collection of visual styles from a wide array of artists that ultimately breeds life into the beautifully ultra-violent world of Mega-City One and Judge Dredd. Filled with stunning art and loads of bloody action, Dredd takes on a host of bad guys, demented serial killers, the vengeful alien Trapper Hag, robots, and random law-breakers. With a wide assortment of stories, styles, and tones, this is a must have for fans of Dredd or violent dystopian tales. Being an anthology collection, it would be really difficult to actually discuss every single story without becoming repetitive and boring, so I’m only going to highlight some of the stories and art that personally stood out to me. First is “The Revenge of Trapper Hag,” which sees Dredd battle the gorilla-like bounty hunter Trapper Hag. It is reminiscent of many Batman tales in which he takes on a villain that is more than twice his size. The art from Siku is rich with heavy black shading and solid, vivid colors. While not containing as much intricate details as other artists, his style and the way that he draws figures and their movements is quite unique. If anything, it might draw comparisons to Sam Keith’s work. Next is “Art for Art’s Sake” that features incredibly impressive artwork and colors from Simon Davis. Dredd takes on a trio of art-forgers in an exhibition of live art and the story combines a great deal of comedy and action with various pieces of historical art, which all converse and react to Dredd since they are all alive. Seriously, words cannot accurately express how amazing the art from Davis is, which appears to be a mix of paint and collage. “Future Crimes” is a darkly comedic tale about a person being arrested for a murder he is going to commit in the future. The art from Mick McMahon is slightly cartoonish and contains thick black outlines around the characters, along with thick line work and heavy dark shading. The characters are all somewhat abstract in both their body forms and facial features. “Old Pal’s Act” finds Dredd chasing down a former friend-turned criminal whose in a flying bathtub. It’s not often you see the likes of this and the Art from Cam Kennedy is fantastic. “Pumpkin Eater” is a twisted tale about an obese couch potato who becomes a serial killer, taking away the spotlight from another demented killer. Once again drawn by Siku, his rendition of the Pumpkin Eater serial killer is fabulous, making fine use of space and shading. With 24 stories, there’s so much outstanding artwork filled within the pages of Dredd #31 that I could easily mention each one is some fashion. With the immensely varied artistic styles and assortment of unusual stories and characters that Dredd takes on, there’s really a little bit of something for every fan of sci-fi or ultra-violent action.